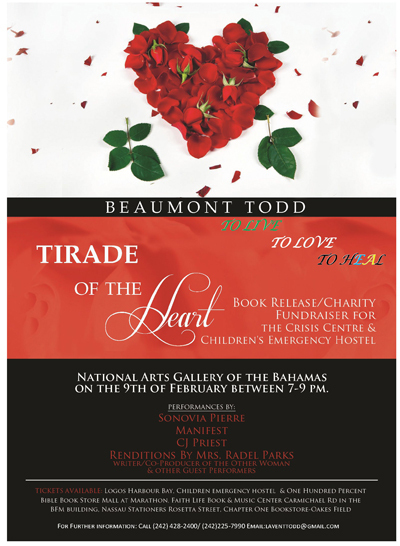 Nassau, Bahamas - Bahamian poet Beaumont Todd is a recently published Bahamian author with the release of his book, Tirade of the Heart, a compilation of poems that have spanned the last eighteen years of his life. charity fundraiser for the Crisis Center and Children's Emergency Hostel. open to the public at 630 and the event will begin promptly at 7 pm. "Tirade of the Heart takes you on a journey through my love’s lost, sadness and loneliness, and my greatest inspirations from nature and God. Some of my more inspired poems were written during my greatest times of tragedy. These included when I had lost my brother and grandmother within three months of each other in 1998, and then both my uncle and grandfather in 2007 to 2008 within eight months of one another," said the author. Presently he's a volunteer with the Crisis Centre. "I have always been heavily pressed on my heart to do something to help with all of the hurt I see around me and have experienced in my own life personally," said Todd. "The crisis center heart is about helping people who are hurt, abused and more importantly helping those persons find healing and teaching about how to avoid having the same occur. This directly ties into my heart's calling and even the reason I wrote my book," he said. Beaumont Lavent Todd was born on the island of New Providence located in the Bahamas on December 6, 1978 to mother, Sharon Minns-Smith, and father, John Alexander Todd. He is the proud father of one beautiful daughter, Shaneya, and one handsome son Henrí. He lives a quiet life with his beautiful wife, Shcanla who is his greatest support and friend. For him writing poetry has always been a venue to express in words the emotions and insights he saw in life around him that were hard for him to express and communicate verbally. He loves writing and has always been inspired by the people and events in his life. Beaumont says Words are the voice of his very soul and a beautiful way to share the different ways we live and view this beautiful world we live in. His hope is you enjoy the journey through his life and heart he shares in his writing and poetry. 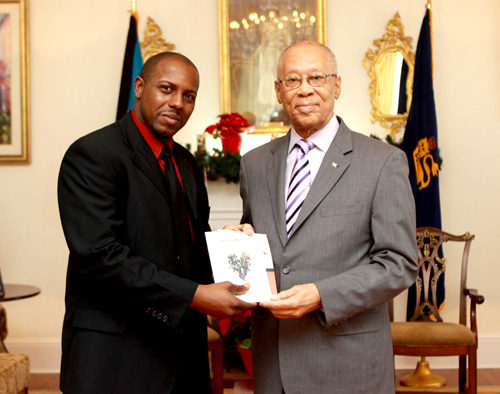 Poet Beaumont Todd presents his book to Governor General of The Bahamas.